October | 2012 | Quilting my way through life! Market, like Christmas, seems to come faster each year. Is this a sure sign that I’m getting old? and home to some of the smallest parking spaces anywhere I’ve even driven! It really is a pretty city. We’re staying out at the Galleria again. Our drive each day will take us through beautiful Memorial Park. It will undoubtably be full of joggers, walkers, and sport enthusiasts of all types. If I lived in Houston, it would have to be near Memorial Park, so I too could be one of them. we will just have to enjoy the park on our drives to and from the convention center each day. We will get plenty of exercise setting up our booths and standing in them all weekend. That’s ok, I’ll take it! I hope you have an enjoyable week. I’ll be back with photos upon my return. 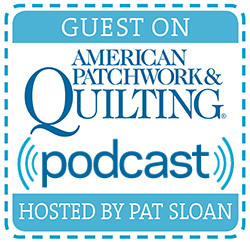 Quiltmaker’s 100 Blocks from Today’s Top Designers (and me)! The issue will be out in November and there will be blog hop to introduce the new issue. The hop will be November 5th – 9th. My blog day is November 5th. You’ll want to check out the Quiltmaker Blog beginning November 5th so you can visit all the participating designers with blocks in the issue. There will be all kinds of give-aways! This will include the original blocks from the issue as well as free copies of the magazine and who knows what else? So, mark your calendar and don’t forget to join us for fun and freebies! now you can see what I can do with pre-cuts. 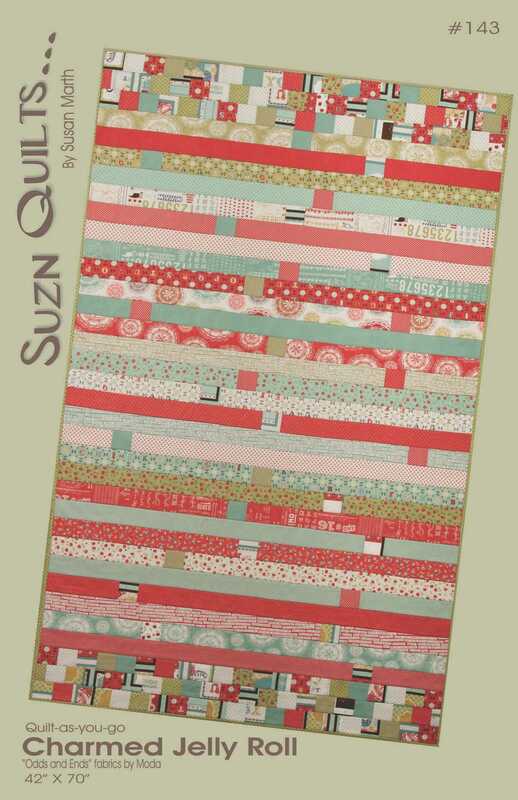 This next quilt is made with just one jelly roll & a charm pack. The only other fabric you’ll need is 2 yds. of backing fabric and you’ll have a nice lap quilt. It’s made with my quilt-as-you-go technique. So, you know you can make this quilt in a day because with pre-cuts, the cutting is done for you. This is yet another sample of what you can make with the new Odds & Ends by Julie Comstock for Moda. The colors are bright, yet soft. No applique here, just straight piecing and no wondering how to quilt it when you’re finished, you’re quilting as you sew it. 2.) Walking foot is a must! Incorporate one into your Christmas gift sewing this year and you’ll be making more throughout the year, they’re that fun. Charmed Jelly Roll is available on my website now. 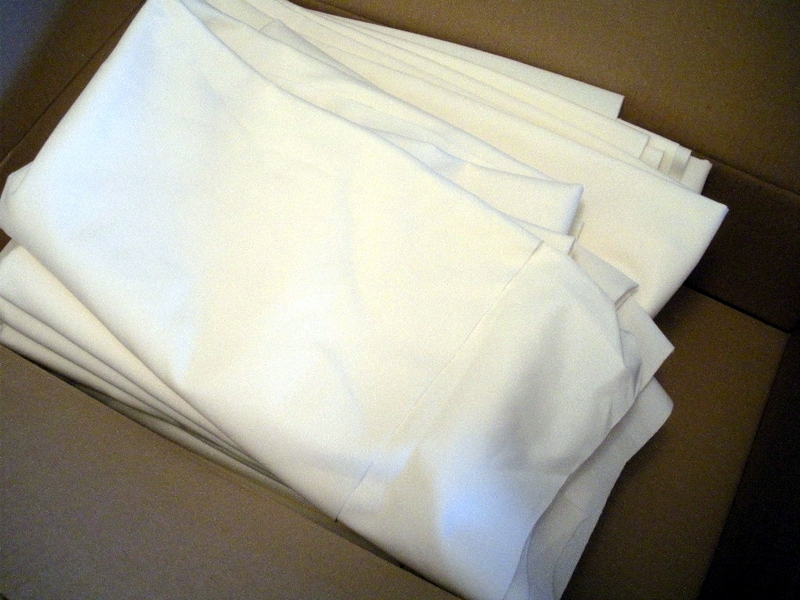 Pictures of fabric are nice, but nothing compares to having the fabric in-hand. I’m ALWAYS inspired to design with fabric that I can handle, how about you? That’s why when once I had all the samples for my “Name That Quilt” book made with Odds & Ends fabrics by Julie Comstock for Moda, I was inspired to create this next sample from my scraps. Once I have the fabrics and start sewing, my brain just starts creating and won’t stop. By chance I had just enough of the right fabrics to create this. Daisy Baby Buggy is all pieced, using two fabrics for the buggy, plus a background fabric, then the daisy wheels & handle are appliqued on top. This kind of piecing always reminds me of building a puzzle. 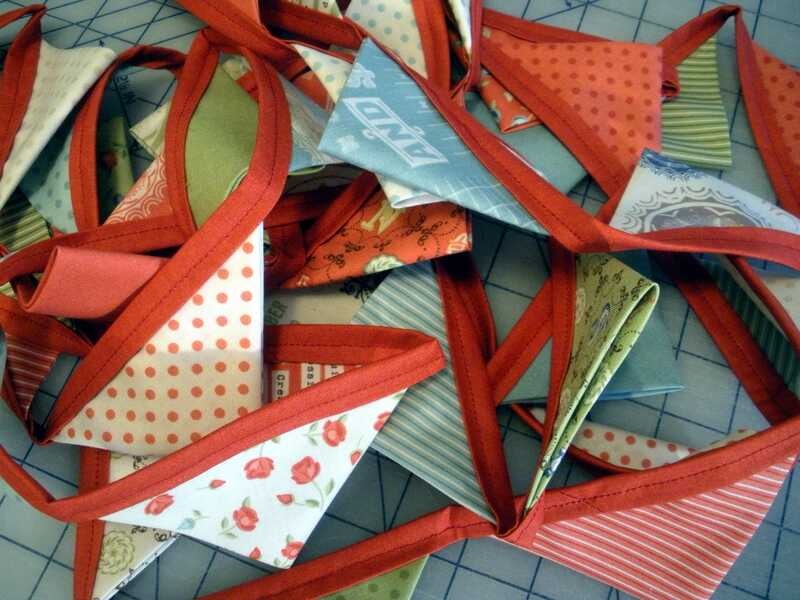 I lay out the fabric squares on my design floor and start to sew. If you chain piece the squares, you’re less likely to get the squares out-of-order while sewing. 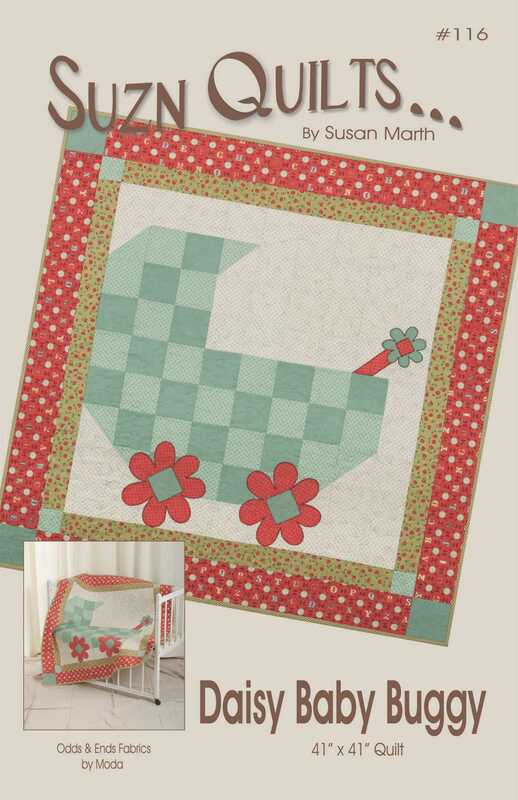 Another cute baby quilt don’t you think? Want to know something else nice about this pattern? It’s small enough you can easily quilt is yourself. A great way to practice your machine quilting if you’re not already proficient. visit with a friendly shop owner & have some fun? I spend plenty of hours at my computer, but not fabric shopping! Daisy Baby Buggy is available on my website now. I finally have all of my printing done for market, yeah! My new covers and books were delivered last week, but I’ve been busy doing other things like getting my distributor packets together, packing & putting the new designs on my website. So, as I introduce my new designs this week, know that you can go to my website and order them and not have to wait for me to do that task after market. Now for the best part, introducing them to you. You may remember me showing you the new Odds & Ends fabrics a couple of months ago, and then showing you the backing and batting of all three of these quilts basted and ready to sew. Along with them I also designed and sewed some name banners. I was lucky enough to get two more perfect models; Delaney my little friend, and my new great-nephew, Benjamin. 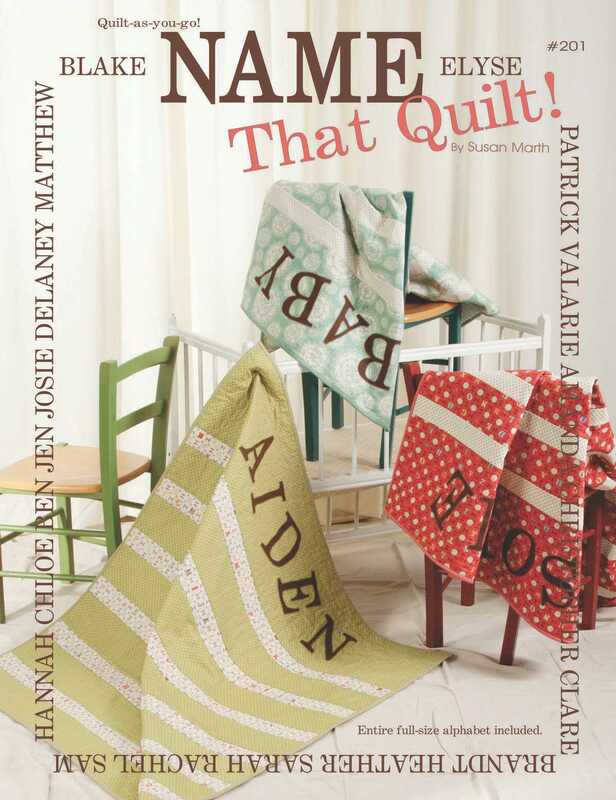 In this new book you’ll find Quilt-as-you-go instructions to make the name quilts in either baby size or lap size. 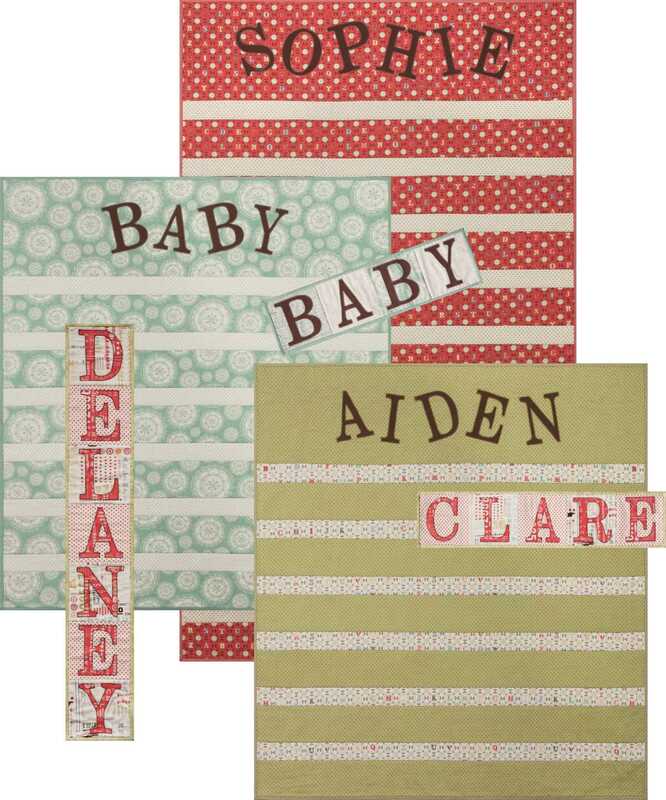 The name banners can be made either horizontal or vertical and can say anything you want, not just names. Entire full-size alphabet is included. Instructions and yardage guidelines are given in the book too. This summer our family moved into the next generation with the birth of Benjamin. Upon trying to decide what to give the expectant parents, knowing I would be setting a precedence with 10 nieces & nephews plus 3 kids of our own, I decided on a quilt using my unique quilt-as-you-go technique. It’s really quick, cute and usable! I was able to match Benjamin’s nursery colors, personalize it with his name and it was quick & easy. I also thought ahead for those of you sewing for babies that maybe are not named in time for gift sewing and giving, just put on it the word “BABY” such as I did for the quilt above that Ben is lying on. Problem solved! I’m so excited knowing when all those babies start coming very close together, and you know they will and soon, I will be able to sew up a quick quilt by just selecting 3 fabrics and starting to sew. Pretty smart of me, huh? I hope you will give them a try. Look for two more new designs coming up. I feel like a child, anxiously (and impatiently) waiting for Christmas! 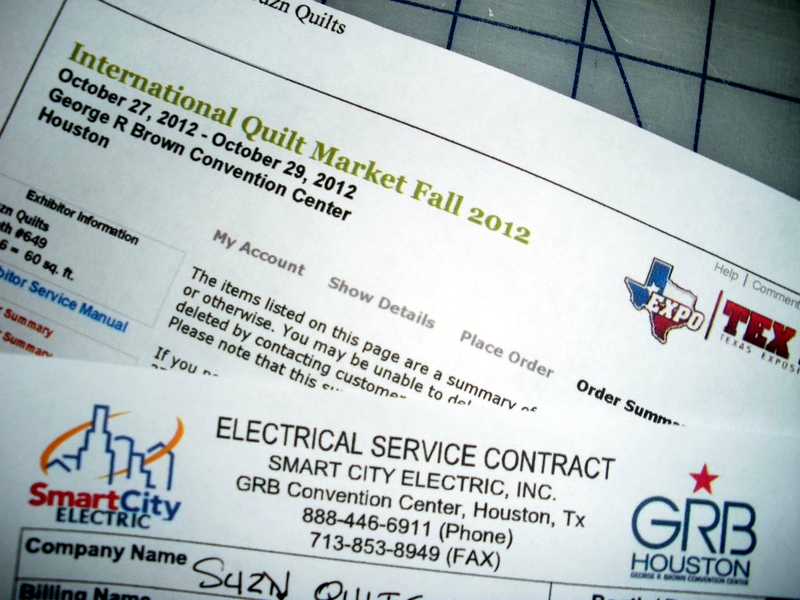 FedEx has my covers and brochures for Fall Market in Houston where I’ll be going in a couple of weeks. Tracking says I should get them today. Wood River Printing is working on my new booklets. They’re local and told me Tuesday or Wednesday, so as soon as I get the call, I’m there! I don’t know why, but it’s always exciting to see my patterns in final form. Yes, I’ve looked at them many hours already, but seeing them in polished form is so exciting to me. It’s kind of like finally getting to wear that new Easter dress mom made along with the new coordinating shoes that were bought weeks in advance. I can still remember trying them on in front of the mirror countless times. 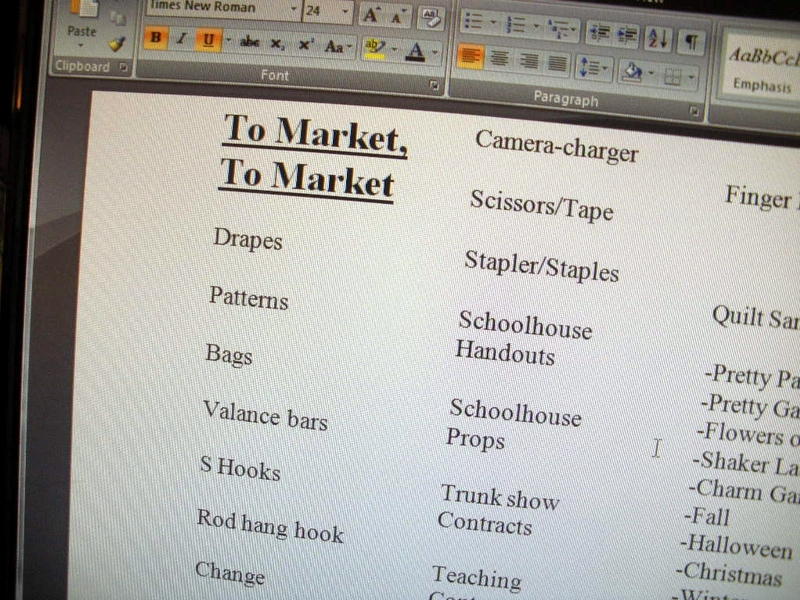 and creating a new list of items that I’ll be taking with me to Houston. Does this look as fun as standing in front of a mirror with shiny new shoes??? For now I will just keep moving toward my final destination…market! It will look cute hanging in my booth with my coordinating quilts. I can’t wait to put it all together. Been out at the quilt shops? Seen the new “Odds and Ends” by Julie Comstock for Moda??? Have I at least enticed you to check your nearest quilt shop the next time you’re there??? and I really hope you pick some up so you can make some of my new patterns with it!